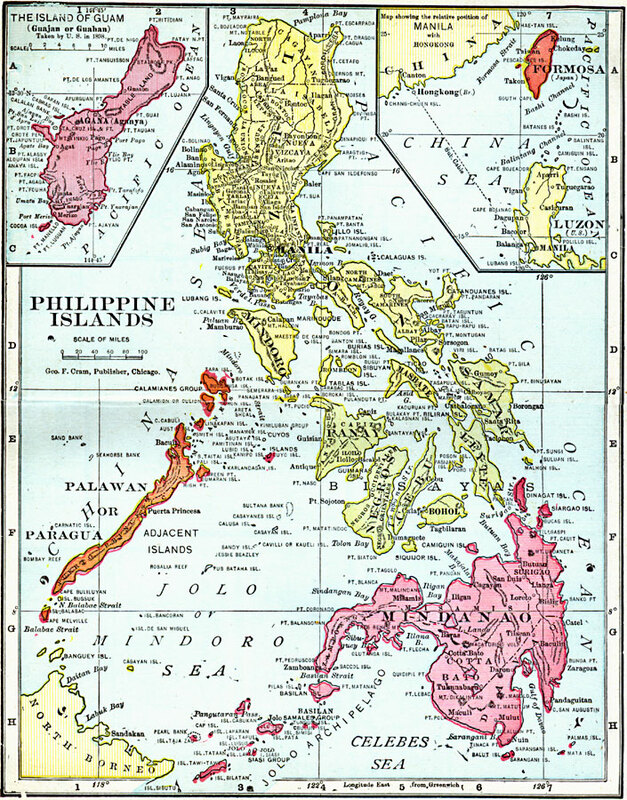 Description: A map from 1906 of the Philippine Islands, showing the province boundaries at the time, the capital in Manila and other major cities, railways, terrain, rivers, and coastal features of the island group. The map includes an inset of the island of Guam (Guajan or Guahan) taken by the United States in 1898 under the Treaty of Paris at the end of the Spanish–American War (December 10, 1898), and an inset showing the relative position of Manila with Hong Kong, China. The inset map also shows the submarine telegraph cable between Manila and Hong Kong, and shows the island of Formosa (Taiwan) as a possession of Japan at the time.